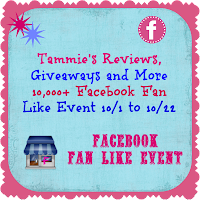 I am so happy to have found Tammie's Reviews, Giveaways and More. She is a wonderful woman who recently hit a very big milestone---she now has 10,000+ Facebook Fans. That's an amazing accomplishment and I'm happy to be able to pick her brain and share in her celebration event. Tammie wanted to tell all of you, "Hitting a milestone like this could only be accomplished by wonderful and awesome Fans and Followers like all of you. I want to thank each and everyone of you for helping me to achieve this." Enough said....Let's get on with the Event!!!! Tammie is allowing me to share in the fun and be a part of this mega giveaway event. RewardIt is a web site where they offer sweepstakes and contest. 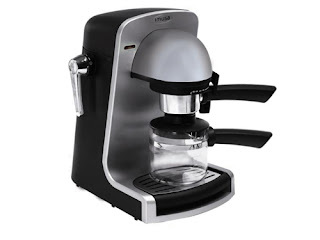 I really like the site and it appears your chances are better for winning a prize. imusa is providing a Bristro 4 cup electric espresso maker with white cups. The machine is featured in the picture above. imusa is a company that offers products to make your world easier. They offer a wide arrange of products from cooking to others. is supplying a Gift Basket filled with cat and dog toys and some cat food too! Tammie shops at PetSmart for her 2 little furbabies. They have everything and anything you may be looking for. They never disappoint and always are sure to please you. is supplying a code for $42 to use on their site and it comes with FREE shipping on what ever you order. I (Robyn) have recently discovered this site. It's a really neat place offering lots of beautiful stationary and scapbooking items to just about anything you may be looking for to make your life easier and more organized. Tammie has pulled this event together and decided to share with us. She says, "Some of the most wonderful and terrific Bloggers have come together to help me promote this Event. I do not know where I would be without them. So without further ado....LET'S GET THIS THING ROLLING!!!" The Event will be live from 10/1 at 9 p.m. to 10/22 at 9 p.m. The Giveaway Tools widget is very easy to use, just follow as it prompts you....It will not let you enter an entry if you did not do what it is asking for. If you have any problems or need to ask a question...just email Tammie at pankuch1605[at]hotmail.com and I will get right back to you. Do not forget to let the page fully load. Good Luck To Everyone And Thank You For Entering!!! Disclosure~ Tammie's Reviews, Giveaways and More along with the bloggers helping to promote this Event are not responsible for prize fulfillment. The first winner chosen has 1st choice and 48 hrs to respond to the sent email. Once the 1st winner is done then a 2nd winner will be picked and the procedure repeats from there and so one and so forth. Tammie's Reviews, Giveaways and More has final decision, should there be a problem in this procedure. My cat, Gigi, says: PETSMART! I say $25 gift card. Either way, we'll be happy. I like paper coterie the best because I love stationary. Good luck to all of my blogger friends. Hope you win! !